Our Evandale practice is equipped with four Treatment Rooms, a Rehabilitation Gym and an Exercise Studio. The treatment rooms are used for Hands-On Physiotherapy and Massage treatments and are equipped with height-adjustable beds, face cushions and bolsters for patient comfort. We also have electrotherapy equipment including Interferential Therapy and Ultrasound and have a Traction Machine also. 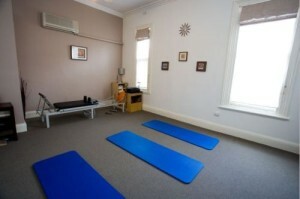 The Pilates Studio has state of the art Equipment including a Pilates Reformer, Multi-chair and Trapeze Table. We also have Pilates Exercise Mats, Foam Rollers, Pilates Magic Circles, Theraband, Pilates Balls and Chi balls for our Mat Pilates Classes. The Rehabilitation Gym has a range of cardio equipment including a treadmill, rower, exercise bike and mini-tramp as well as the latest pin-loaded resistance machines, exercise balls and free weights.